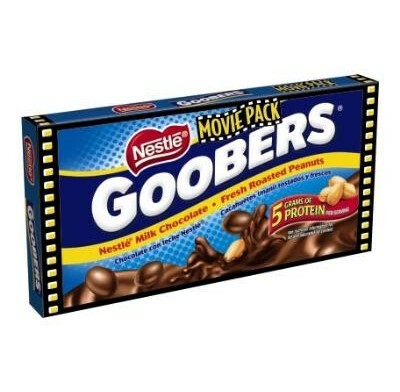 GOOBERS 3.5oz. MOVIE THEATER SIZEThe Goobers Movie Theater Size (3.5 oz.) box from Nestle is filled with fresh roasted peanuts smothered with Nestle classic milk chocolate! These candies have been a crowd pleaser for over 70 years. With our movie theater Goobers pack, you'll save big and have sweets to share with all your friends and family. Sweet City Candy is your wholesale candy headquarters. Enjoy bulk Goobers Movie Theater Size candy boxes delivered fast, right to your door at low wholesale prices. If you can't find the candy or chocolate you are looking for, If you can't find the candy or chocolate you are looking for, contact us and we will be happy to help you in any way we can. and we will be happy to help you in any way we can. 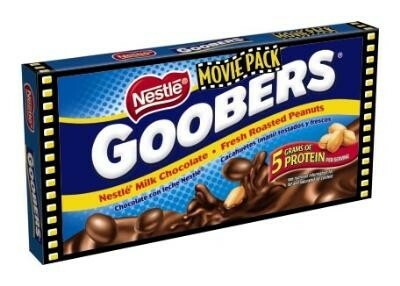 GOOBERS 3.5oz. MOVIE THEATER SIZEThe Goobers Movie Theater Size (3.5 oz.) box from Nestle is filled with fresh roasted peanuts smothered with Nestle classic milk chocolate! These candies have been a crowd pleaser for over 70 years. With our movie theater Goobers pack, you'll save big and have sweets to share with all your friends and family. Sweet City Candy is your wholesale candy headquarters. Enjoy bulk Goobers Movie Theater Size candy boxes delivered fast, right to your door at low wholesale prices. If you can't find the candy or chocolate you are looking for, If you can't find the candy or chocolate you are looking for, contact us and we will be happy to help you in any way we can. and we will be happy to help you in any way we can.